The Historical Society of Cheshire County will offer the first lecture of its 2018 Wyman Tavern Lecture Series Tuesday, July 24, at 7 p.m.
Lynn Keating Murphy, Abenaki Indian, master educator, and descendant of the Sadoques of Keene, will discuss the history of her family in the Connecticut River Valley and Quebec and their basket-making traditions. The history of the Sadoques family intersects with this area, and provides insights into the complex story of the Abenaki people in the region. The talk will be held at the historical society’s headquarters, 246 Main St. in Keene, and admission is free. 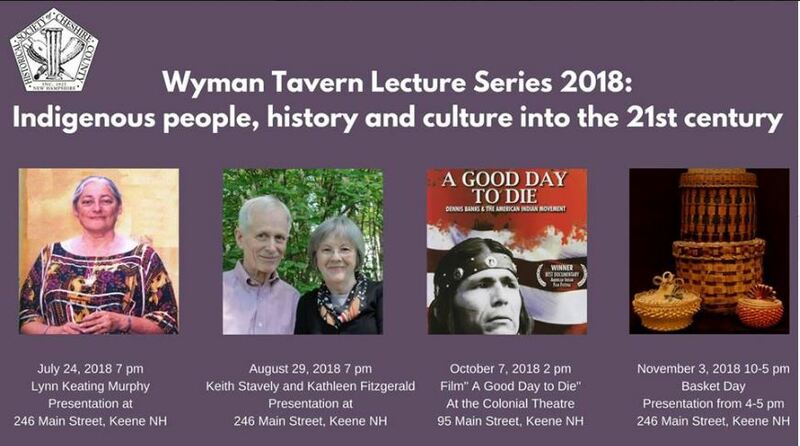 The theme of this year’s Wyman Tavern Lecture Series is “Indigenous people, history and culture into the 21st century.” The Wyman Tavern Lecture Series will continue Aug. 29 when Keith and Kathy Stavely do a book signing for their early American cooking book — “United Tastes: The Making of the First American Cookbook” — and Linda Stavely prepares samples of early American recipes including a Native-American-inspired dish. On Oct. 7, The Colonial Theatre will host a showing of “A Good Day to Die” — a 2010 documentary that chronicles the American Indian Movement that fought for the civil rights of American Indians. The series concludes Nov. 3 with a “Basket Day” at the historical society. Members of the public are invited to bring their baskets, and basket experts will be available at the full-day event to identify and record the age, origin, physical characteristics, and known history of each basket. Basket Day will end with a talk by basket expert Lynn Clark on the history of Native American baskets in the Monadnock Region and New Hampshire, and by Lynn Murphy on her family’s Abenaki Indian basket history. More information: visit hsccnh.org or call 352-1895. See the original listing in the Keene Sentinel.